Today was a rough day. I spent my morning worrying about my best friend and feeling helpless that I had to work instead of be there for her during a rough day. Then I spent my afternoon worrying about Isabel and an issue we were having at her preschool. Then I also had to throw in some worry for the state of my house and the fact that there is a shower at my house in a mere THREE days. So when Drew got home this evening, and while we were trying to figure out what to do for dinner, I was desperately thinking of something fun and stress free. 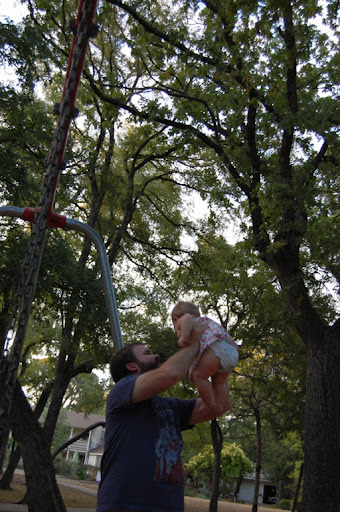 Drew had the idea of taking Isabel to swing, one of her absolutely favorite things in the world. 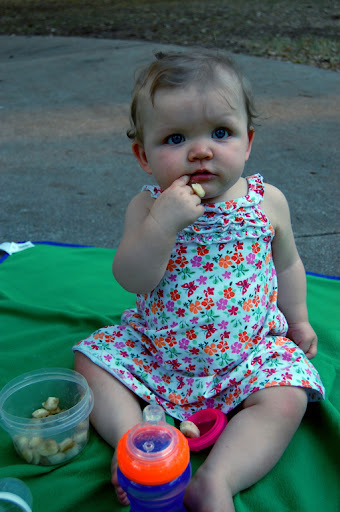 I took that one step further and decided a picnic dinner at the park was exactly what we needed. It has been great weather this week, we haven't gotten to spend much time together lately, and it was great to get out of the house and not think about things for a bit. 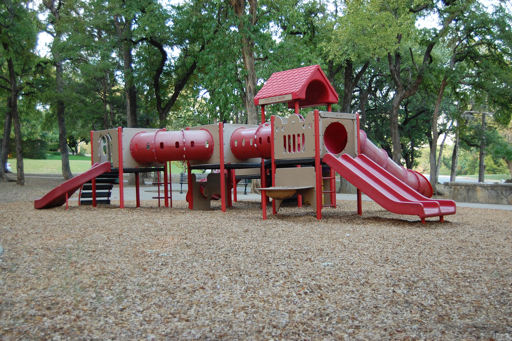 We chose a neighborhood park with many names - Annie Stevens Park, Toddler Park, Red Park... Take your pick. It's a small park in a beautiful neighborhood with baby swings and small scale climb-ons. I made Drew and I some sandwiches, and packed Isabel a cut up banana and some turkey. Isabel cracks me up with her eating lately. She LOVES food (hmm, wonder where she inherited that). She loves to try new things and loves to express how much she loves her dinner with exuberant "mmmmms". One of her favorite things lately is bananas. If she keeps eating so many of them, she might turn into one! After we ate, we headed to the swings. 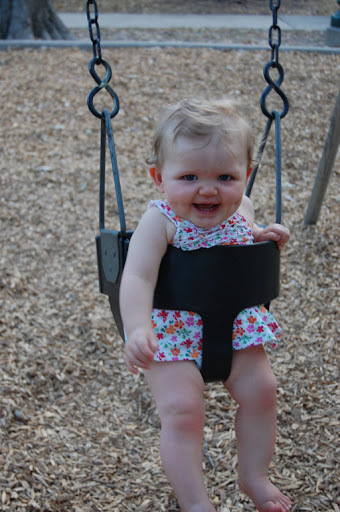 Drew pushed Isabel in a baby swing and she was laughing and smiling big time. It was probably the greatest thing I have seen in a long time. She had so much fun! As if Isabel needed another reason to adore her daddy - swings and the outdoors. We are going to have a fun fall!